Once the Wildcats’ quest for perfection has either been extended or denied, Selection Sunday will come down to what it always comes down to — top seeds and bubble teams. No. 1 seeds: Kentucky, Villanova, Duke and…. I’ve been at some pains to suggest that getting or not getting a No. 1 seed doesn’t really merit the amount of discussion and study it receives. Alas, my efforts have failed miserably. Even you, a reader who’s come of your own free will here to John Gasaway’s own personal site, care about who gets a No. 1 seed, don’t you? Admit it, you do. Consensus — which, mind you, has been fallible on this question in past years — reigns supreme on Kentucky, Villanova, and Duke. The only question appears to be whether the fourth No. 1 seed will go to Wisconsin or Virginia, meaning today’s Big Ten title game between the Badgers and Michigan State will lead to much speculation that Bo Ryan’s team has either won or lost a top seed. Over the years the committee has changed its tune back and forth over whether it has both the time and inclination to reshuffle the entire bracket according to the outcome of a single Sunday afternoon game that does not have a bid thief on the floor. Conversely this year the committee already has Connecticut-SMU on its plate. The Huskies are bona fide bid thieves, and that game doesn’t tip until 3:15 Eastern time. There are brackets built right now in Indy based on both a win and a loss for Kevin Ollie’s team, and maybe the committee was feeling so diligent that they did the same with respect to seeding and Wisconsin’s game too. We shall see. First, Virginia’s membership is predicated on the assumption of a healthy Justin Anderson, and thus far we haven’t seen that assumption fulfilled. Second, if you fret openly about the Cavaliers’ “spells” where they don’t score — and in a non-healthy-Anderson paradigm you are free to do so — I compel you to similarly worry about the spells where Duke looks like a bunch of sedated frogs in the rain and allows teams to score at will. And, lastly, despite the fact that they’ll get a No. 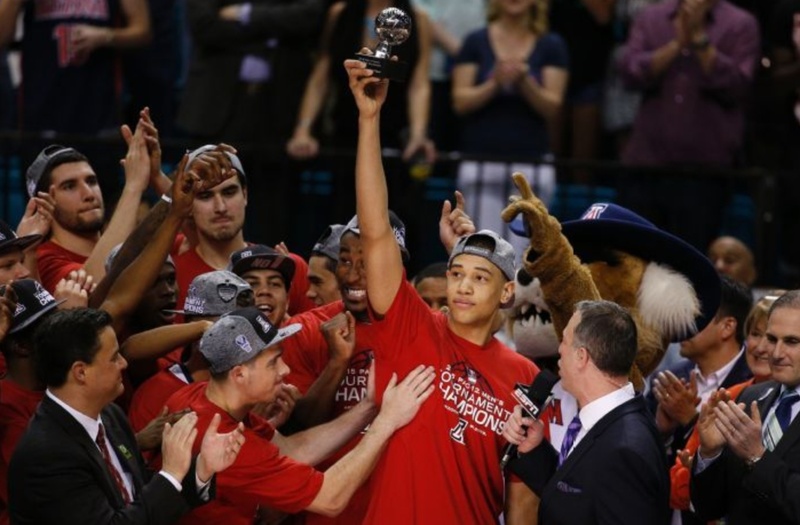 2 seed, the Wildcats of Tucson are arguably better than the Arizona team that was put on the top line last season and came within a single 45th-minute possession of the Final Four. I like to define the bubble in terms of competing projections of the tournament field, and the thing that stands out about the bubble candidates at bracketmatrix.com is how the bracket-making hive views Indiana and Ole Miss as a distinct class that has no other members. The Hoosiers appear in 85 percent of the brackets scooped up by the good people at the Matrix, while the Rebels see their name pop up 80 percent of the time. That’s notable because no other team in the projected field shows a number lower than 90 there (BYU: 92 percent), and no other bubble team even sports a figure higher than 19 (UCLA). The drop-off after IU and Andy Kennedy’s team is drastic, meaning the bubble could come down to simply those two teams competing for the last spot in the field. And, of course, if Connecticut steals a bid today by beating SMU at home in Hartford, the potential exists for a completely surprise-free bracket reveal in terms of selection (though never with regard to seeding or geography — that is likely impossible). Naturally the committee is always free to pull a rabbit out of its hat, the way it did with SMU (out) and NC State (in) last year. So what I’ve set forth here is not only one working definition of the 2015 bubble (Indiana and Ole Miss) but also one possible set of boundaries for rabbits and hats (anyone else). “Anyone else” includes Murray State, which appears on two percent of the brackets scoured by bracketmatrix.com. To fully appreciate the MSU phenomenon, you have to see the Racers’ rise in relation to the positions occupied by the usual disputants on these matters. On the one hand you have the NCAA, a group that chooses to look at wins, losses, opponents, and game location. Year after year the good people in Indianapolis generate a list of 68 teams that, whatever its shortcomings may be, is at least broadly predictable in its composition because said list is always based on those four qualities and nothing else. If the NCAA were even a tiny bit more random in its actions on this front, Joe Lundardi would cut a much less serene figure. On the other hand you have a small and obscure but nevertheless dedicated band of fans who like to look at wins, losses, opponents, game location, and possessions. I belong to this second group, and on occasion I may think the NCAA’s evaluation of a given team is lacking. Yet even a battle-scarred underdog like yours truly at least draws a modicum of comfort from knowing in advance which team evaluations the NCAA is hard-wired to hook badly into the rough. If the NCAA’s errors were less predictable, I would not be the contented if occasionally cranky meliorist you see before you. Then this Murray State thing happens, and suddenly on Twitter there appears a group of dedicated souls marching grimly to and fro on behalf of the Racers, kitted out with a hashtag and outrage to burn. Whenever a major-conference bubble team loses, MSU’s advocates take this as ineluctable proof that Steve Prohm’s team should be dancing. This turns out to be an ingenious discursive tactic because every at-large team in the country will enter the NCAA tournament coming off a loss. Imagine for a moment that, bewildered by this turn of events, the NCAA breaks from its long-standing routine and seeks outside counsel. The following conversation then takes place under a flag of truce between the NCAA and yours truly…. NCAA: What in the name of Walter Byers and Wayne Duke is going on with this Murray State thing? Their RPI’s strictly meh and their strength of schedule looks like something that oozed out of a diseased marmoset. ME (charging forward with laptop raised in attack position): AAAAIIIIEEE! THE RPI IS A COMPLETE AND TOTAL WASTE OF…. Wait a minute, you mean the RPI says Murray State doesn’t belong in the conversation? ME: Man, that’s so weird. That’s exactly what accurate stats say too. NCAA: So why is everyone yelling about this on Twitter? ME: Because the Racers won a lot of games. That being said, you guys gave an at-large to Middle Tennessee State out of the Sun Belt a couple years ago — so special dispensations are at least possible. And, anyway, if the OVC title game were played concurrent with the big tournaments no one would even be talking about this. The timing just worked perfectly for the Racers to pose as Long Suffering Mid-Majordom. But, let’s be honest, over the past few years you’ve screwed up royally on some mid-majors that were WAY better than Murray State…. NCAA: Fine. Got the picture. Thanks, John…. ME: I mean, seriously, remember Drexel in 2012? What was up with that? Were you throwing darts blindfolded? NCAA: We’ll call if we need anything. The NCAA is free to invite the 68 teams that it wants, and if you hear Murray State’s name called tonight it will mark arguably the most dramatic departure the committee’s ever made from its standard operating practices. A bid for the Racers would also be guaranteed to become the single most-invoked precedent in the history of tournament selections, because henceforth teams with terrible SOS numbers would have reason to believe they still have hope. This entry was posted in hoops, in many ways the work of a critic is easy on March 15, 2015 by johngasaway.